You can pretty much speedrun anything: Google doodles, having your video game children taken away, and even (video game) marriage. 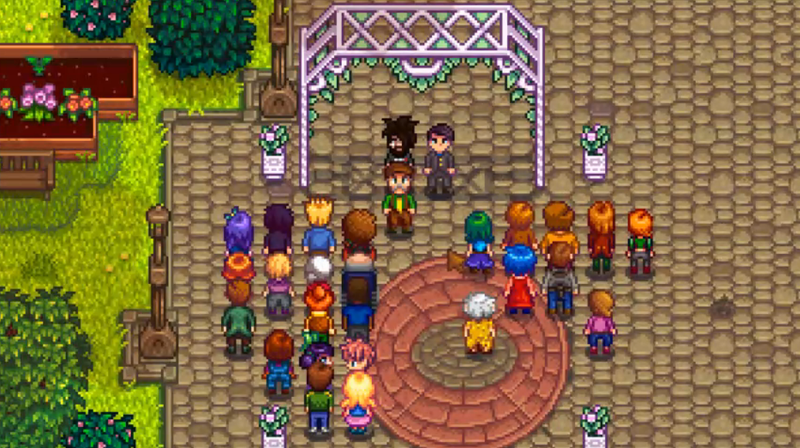 While many fans deliberate for a good while over what characters to romance in Stardew Valley, for the past year, some players have sped their courtships up through speedruns. Three days ago Underscore76, the current record holder, managed to get married in 26 minutes and nine seconds. Congratulations! Underscore76 opted for Shane in his winning run. While Maru is the most often married character in Stardew Valley speedruns, Shane gets up the earliest, which shaves down some time. Another thing that helped Underscore76's run was taking advantage of a glitch where, if you name yourself after the ID number of items in the game, those items will spawn every time another character says your name in dialogue. Underscore76 named himself after the IDs for a Prismatic Shard, a Bouquet and a warp token that returns the player to the farm. That’ll cut down on a lot of walking, and they’ll end up with top tier gifts almost every time they talk to anyone in town. What this process looks like in action is standing outside of Shane’s house every morning until he wakes up and giving him a rare gem. How romantic. Underscrore76 married shane on the 12th of Summer, which is basically a month and a half of in-game time. In the description for the video of their run, Underscore76 that they could still shave some time off because of “some sloppy movement.” I’m still impressed. I hope you and Shane have a happy life together.